YABE-EN-CHAHO:PROJECT 2 DONATE:WA WA PROJECT-Social Creative Platform for Opportunity-Know and support projects in eastern Japan ! There is the tea shop(YABE-EN-CHAHO) in the shopping arcade on the sea road of Shiogama City that has a seventy-year history. Overcome by a tsunami tall enough to envelop the whole arcade, everything necessary to keep the business running was washed away, but Yabe reopened in the centre of the arcade with extraordinary speed just four months later. Guiding him in his actions was his concern "to do something that could form the foundations for future generations who will look upon us as their predecessors 30, 40, 50 years from now". In addition to the shop, he has also established the company "Tohoku Create" to support the regeneration efforts by finding employment for disaster victims who have lost their jobs, helping them to support their families and return to a "normal life" again. He is aiming to create a system that will generate employment through the utilization of a network of managers in the catering industry, worker dispatch business, collection and transportation and other various other industries. Furthermore, he established the NPO JETO Miyagi in February 2012 which continues to support children who have lost parents in the Great East Japan Earthquake until their twentieth birthday. Presently, approximately 100 children have entered this support program. The Shiogama Shrine is a shinto shrine which at New Year throngs with over 400,000 worshippers marking their first shrine visit of the year. The tourist route which leads up to this shrine is the Kaigandori shopping arcade near Honshiogama Station. The YABE-EN-CHAHO has continued for almost 80 years, specializing in Japanese tea. However, a tidal wave the height of the shopping arcade surged and swallowed not only the YABE-EN-CHAHO but the whole arcade. "On the day of 3.11, I participated in a training course in Tokyo. Soon after an uncommon tremor, I saw on the TV that a tsunami warning had been issued for the Sanriku coastline and tried to make a phone call straight away, but couldn't get through. The following day, I made my way towards Yamagata on the only plane flying to Shounai airport, and then drove by car to return to Shiogama. The damage to Shiogama was truly terrible. A gasoline tank continued to blaze, and tank lorries and tour buses had turned over like toys......... It was like watching an science fiction movie." It was 5 days later when the sea water which had surged the shopping arcade finally receded. While walking through mud up to his knees, Yabe made his way to his shop. Seeing the reality with his own eyes, it was some relief that, while it would take much time before restarting his business, the shop had at least somehow survived. "5 days after the earthquake, I had occasion to visit Ishinomaki which had suffered much more severe damage than Shiogama. The area of Kadowaki Minamihama was totally destroyed. When I saw this, I was moved to think not only about the regeneration of my shop, but also of the necessity of contributing what support I could towards the areas which had suffered greater damage. If I did not make such an effort, I would look back with regret when asking myself 'Did you really do everything you could?' I couldn't ignore what was happening elsewhere." In the cold and snow, the situation, where power and food was not reaching the disaster areas, became unbearable, and Yabe called to friends all over the country to assist with the continual delivery of aid. And as he frequented the evacuation centers each day Yabe was able to hear the "news on site", information not available in the mass media. "About two months after the disaster, there was no longer a shortage of aid, but recruitment and unemployment started to become a problem. Even though there is governmental disaster aid available to individuals, there is no support for small and middle-size businesses which support the country. A situation developed in which people were losing motivation due to lack of work, unable to support their families, and unable to afford a car to go to the hospital.... And so, I thought about establishing a company to give disaster support. This is not an NGO or voluntary organization, but an organization aiming to make profits. Many people from different professions are involved, from the catering industry, security services, worker dispatch business, collection and transportation services, and administrative scriveners, and aims to encourage people to take hold of the opportunities for different types of employment. Of course, there is also a risk in doing this, but support for the regeneration can not make progress if we take on fear." 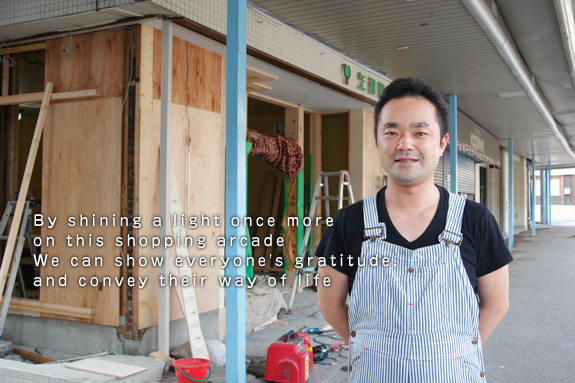 Parallel to employment regeneration support initiatives, Yabe moved to reopen his store in the arcade as soon as possible. Even three months after the disaster, there were still no traffic lights for the shopping arcade, and a policeman directed the traffic with hand signals. 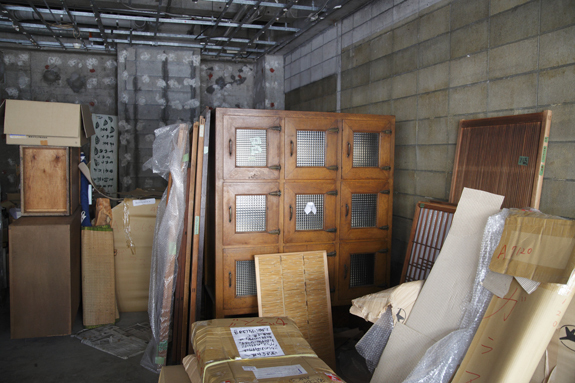 In the storehouse of the YABE-EN-CHAHO, household articles and equipment was arranged in a line ready for the new shop. "For example even if the same tsunami attacked again 1000 years from now, it is certain that it will hit the areas near the coastline. However, what is important here is to understand the route leading to the shopping arcade and the history which has been created here. The Kaigandori Shopping Arcade is a route which takes you directly from the station to the approach of the Shiogama Shrine. Is it right to put out the lights of this route? In this place founded by our predecessors, I want to convey our feeling of thanks to everyone by returning the lights once again. While it may be called a 'shutter street', I have a lot of gratitude to my neighbours of my grandfather's generation whose way of life which has developed over time has enabled me to live here." The light of YABE-EN-CHAHO, which came close to being extinguished, is now being rekindled by Yabe's hands, with each action containing deep concern towards the future of the town. "I want to make a base for future generations, who will call us their 'ancestors' in 30, 40, 50 years from now, and encourage the sentiment of appreciation that 'our ancestors made such efforts so we should also try our best to pave a way for ourselves.' Our children are watching from behind us. When they become adults, they will surely convey this message to the next generation. This is the true meaning of 'regeneration'. I think it is important that we thank our ancestors, and convey once more to the people of the community what we consider to be important for the shopping arcade." YABE-EN-CHAHO three months after the disaster at the time of the first interview. 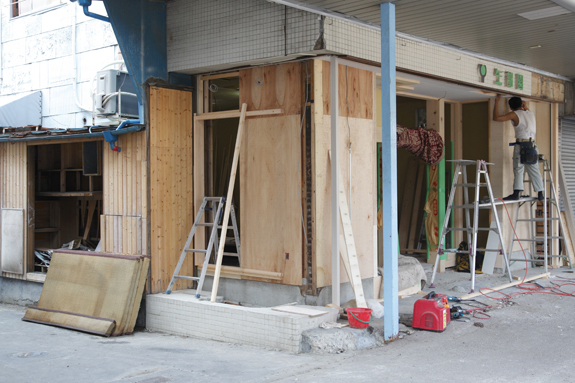 Construction work was taking place in order to re-open the store, the first to do so in the shopping arcade. Household articles and equipment being prepared to once again turn on the light of the shopping arcade. All are discerning objects full of Yabe's strong will toward regeneration.